Windows 7 has greatly improved and simplified the process of setting up BitLocker and the Windows Recovery Environment. In fact both the separate partition structure required for BitLocker, and the automatic failover to the Windows Recovery Environment are setup by default in Windows 7. With Windows Vista neither of these were setup up by default. With Windows Vista the guidance from Microsoft was to create a 1.5GB system partition for BitLocker, and this is exactly what the BitLocker Drive Preparation Tool did. 1.5GB was plenty big to hold the system files plus a Windows Recovery Environment. But, it oddly still fell short of being able to hold a recovery image of any kind since the base install.wim for Vista Enterprise 32-bit is over 2GB in size. Now with Windows 7, the automatically created “System Reserved” partition is just 100MB. This is an interestingly small size, because the Windows Recovery Environment is too big to fit on this partition. The included Windows Recovery Environment, Winre.wim, in Windows 7 is 138MB. The Winre.wim is located on the boot partition in a Recovery folder, and is set as the default recovery sequence in the Boot Configuration Database for the boot partition. This all works great, but things start to get interesting when you enable BitLocker. Enabling BitLocker on Windows 7 causes the Windows Recovery Environment to be removed. The Winre.wim and boot.sdi are removed from the Recovery folder and the BCD entries are deleted. This actually causes errors with integrated features of Windows 7. If you go to Recovery in the Control Panel, and click on “Advanced recovery methods”, you will receive the following error. One interesting aspect of automatic failover with the Windows Recovery Environment is that once you enable BitLocker it will no longer be a seamless process. Meaning that when the system went into failover mode and booted to the Windows Recovery Environment it would prompt for the BitLocker recovery password to first unlock the drive, instead of automatically running the recovery agent. This makes automatic failover not as useful once BitLocker is turned on. Maybe this is one of the reasons that led to the removal of the Windows Recovery Environment when you enable BitLocker. Having the Windows Recovery Environment located in the boot partition has some drawbacks, because you have to read the Winre.wim file from the Windows partition that might need fixing. Thus, if the MBR or partition table becomes corrupt, you can’t boot to the environment that could fix those issues. In the Windows PE User's Guide for Windows 7, it suggests having the Windows Recovery Environment on the first partition on the disk, which would be the active/system partition, but makes it 300MB. So, the roughly 30MB of system files along with the Windows Recovery Environment fits no problem. This seems to make a lot of sense, and I don’t see why Windows 7 wasn’t setup this way by default. 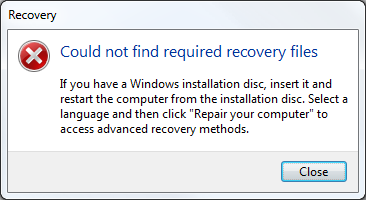 I also don’t see why the Windows Recovery Environment is automatically removed when you enable BitLocker.